Elvis Presley’s mansion home, Graceland, holds enigmatic secrets for the Elvis fan. The second floor of the King’s house is private – very private. Since 1977, it has been kept so private that no tours, no television or film crews nor any photographs have ever been released to the public. This is the one thing, the very last thing, regarding Elvis Presley that has yet to be revealed – it is the last Elvis secret. 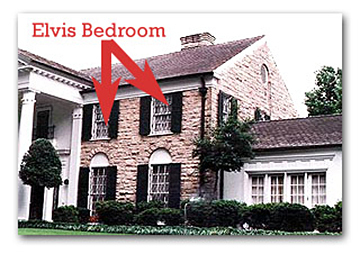 The upstairs bedroom was Elvis’ secluded sanctuary where he lived and loved in his private life. Upstairs at Graceland is a riddle and a puzzle, a fascinating locked-room mystery that draws in the imagination of millions every time they pass by the foot of the staircase leading to the King’s private bedroom sanctuary. Security has never been breached at Graceland but for one exception – when actor Nicholas Cage, a lifelong Elvis fanatic, managed the impossible by using the unlikely strategy of marrying Lisa Marie Presley, Elvis’ daughter. Very clever, Nic! His secret visit to the hallowed halls of Elvis took place during the week of the 25th Anniversary of Elvis’ death, at which time it is said he sat on the King’s “throne” in the bathroom, and he even assumed the prone posture in which Elvis died for some strange reason. He also laid on the singer’s bed and tried on a leather jacket worn by the King. Many celebrities and dignitaries have requested private tours but all have been declined. Locked up tight like a bank vault since August 16, 1977, the staircase to Elvis’ bedroom is protected by two armed guards at all times. The heavily padded double doors are sound proof and secured from the outside by chains and locks.